The format was inspired by the European tradition of “fell” or mountain running, which often requires runners to navigate with map and compass and carry survival gear. 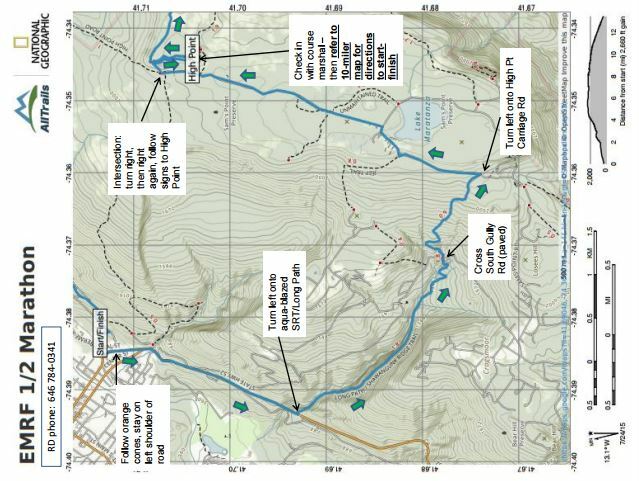 In our case, the event would have a minimalist format, which meant runners would have to use maps to follow the trails, as we would put out no supplemental course markings, and they would have to carry their own food and refill water bottles from streams, as there would be no aid stations. 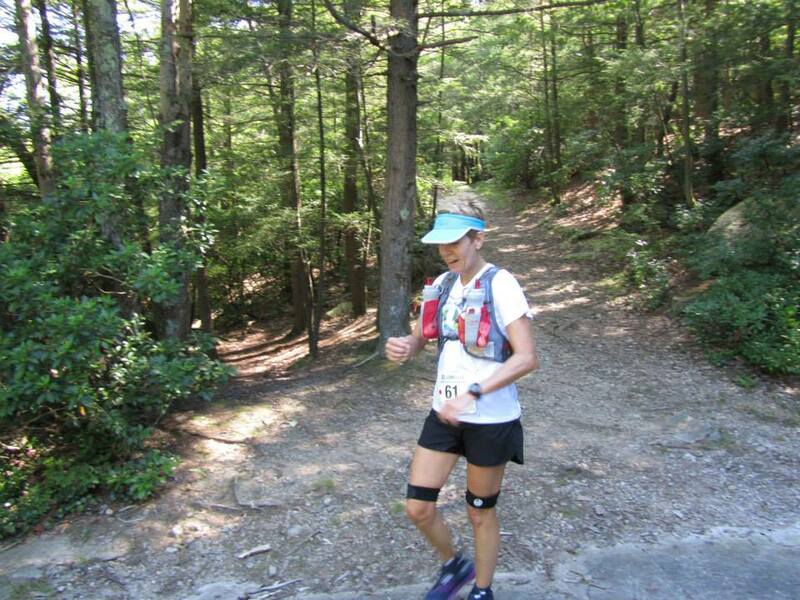 Throw in a mountain with 2,000 feet of gain, carriage roads that are overgrown, washed-out, and in some places hellaciously rocky, and plenty of exposure to the August sun, and you’ve got a challenging race. 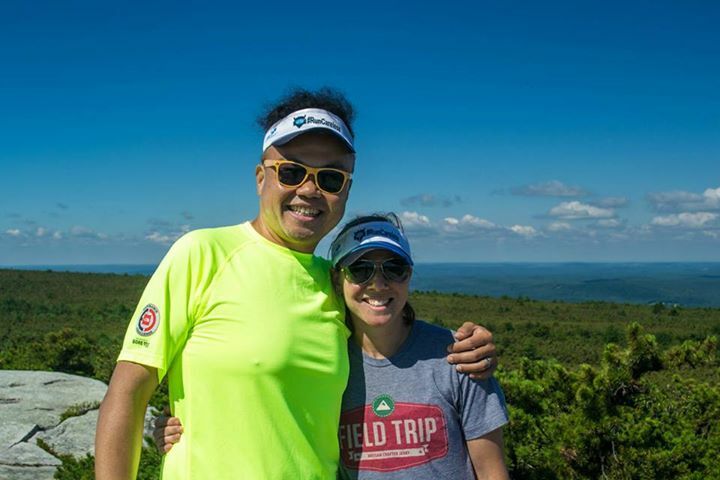 But the race organizers (myself and Todd Jennings) strongly believed participants would find the challenges worth the effort, because running in the Shawangunk Mountains is such a magical experience. 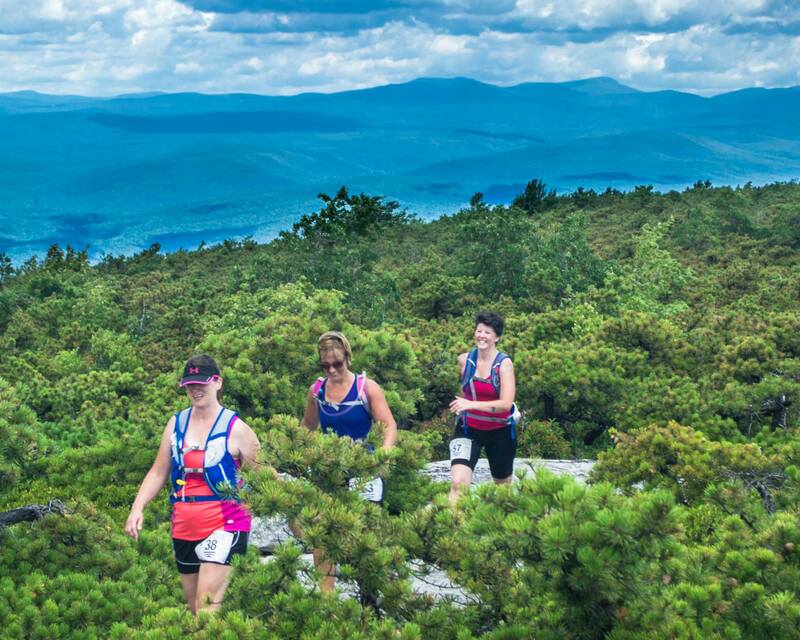 In particular, we designed the course so that each of the three divisions would cross High Point, which at 2,289 feet is indeed the highest point on the ridge, and which offers astonishing 100+ mile panoramas across the Hudson Valley and the Catskills from a white rock ledge surrounded by a sea of dwarf pine. It’s as amazing a vista as you can find in the northeast. Organizing a first-time race can be complex and time-consuming. We had to design, map, and measure the course, work with preserve staff on permits and safety plans, recruit volunteers, and round up radio communications and vehicular support. The best part was taking people out on training runs on the three different courses. However, each time out, the vegetation seemed a little higher, and the trail a little narrower. Putting on my New York-New Jersey Trail Conference volunteer hat and borrowing a battery-powered hedge trimmer, I dove in one day in July and cleaned up three miles of trail. As I was standing on the summit, pleased with myself for the results of a hard day’s work, a violent thunderstorm swept across the ridge and pelted me with marble-sized hail. Perhaps this was pay-back for pruning the pitch pine, or maybe the spirits of the Shawangunks were just having some fun at my expense. By the time race day arrived, we had developed very detailed plans covering all aspects of the event, and soon we would see how good they were. At 8:00 AM, we sent off 24 marathoners. Because of the remote nature of the marathon course, this division was by invitation only. Todd and I had personally screened every applicant, evaluating their racing records and interviewing them to determine whether they had the requisite map-reading experience and confidence to move across the land unsupported. 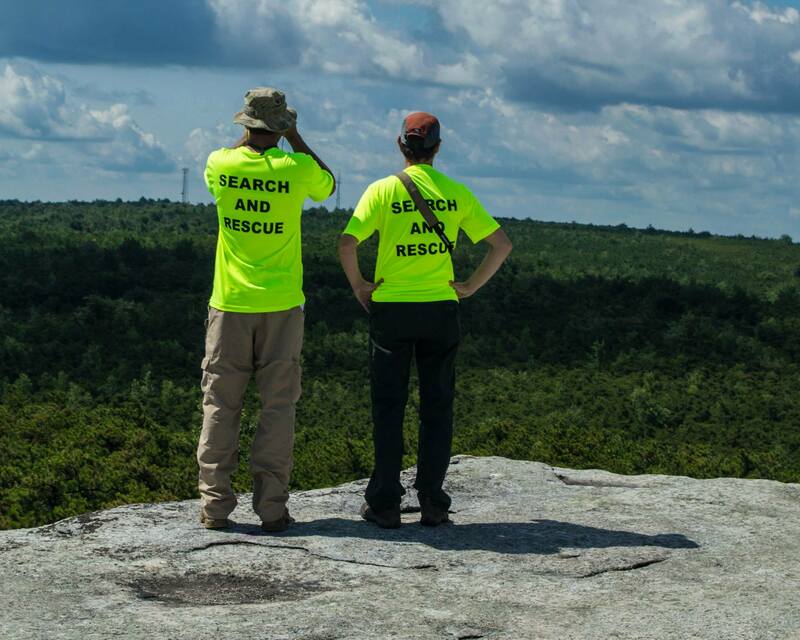 We were very fortunate to have Sam’s Point Search & Rescue support the event with two separate teams. As soon as the last marathoner departed, SAR Team 1 under the leadership of Matt Pozorksi mounted up on an ATV operated by Ellenville Fire District and moved out. They would deploy at a key intersection where they could monitor runners from all three divisions passing by. At 8:30 AM, 33 half-marathoners took off in the opposite direction, following roads through town and along the backside of the mountain, where they would turn onto the steep but spectacular South Gully Trail. I hopped in my vehicle and followed them out and was delighted to see Officer Vasta from Ulster Sheriff’s Office not just slowing the traffic on busy route 52, but waving the vehicles down and stopping them. Meanwhile, at 9:00 AM Todd launched 23 runners in the 10-mile division straight up the mountain. So far, so good. My immediate task was to station SAR Team 2, course marshals Kenneth and Christine Tom and Miriam Weiskind, and official photographer Steve Aaron at the High Point checkpoint. Even before arriving there, I received a call at 9:10 AM indicating that Cynthia Hearing, bib #61 from the marathon division, had gotten turned around. Evidently SAR Team 1 had intercepted her and got her pointed in the right direction again. At 10:09 AM, checkpoint #1 course marshal Ian Erne radioed that the marathon division had passed through except for Cynthia, who was lagging the pack. A few seconds later, to my astonishment, Sue Eby, course marshal at checkpoint #2, reported that the lead three marathoners had just arrived. 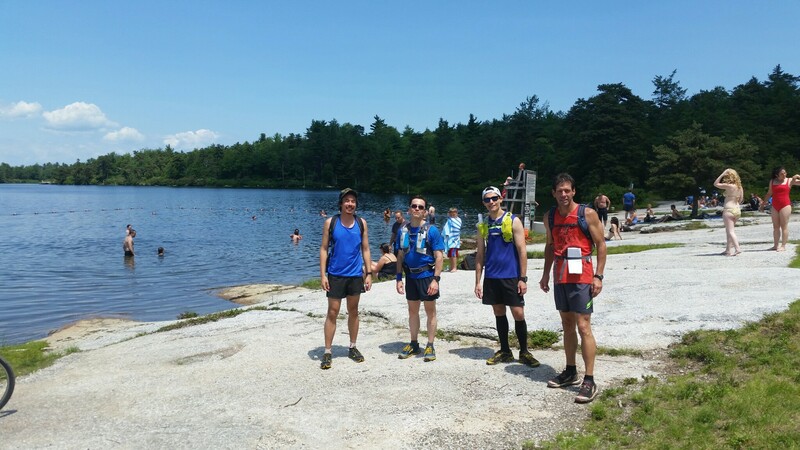 Ben Nephew, Iain Ridgway, and Philip Whitten had covered 15 miles in just over two hours, averaging close to 8:00 minute/miles — a blistering pace considering the elevation gain, rocky and overgrown conditions, and the need to navigate and refill water from streams along the way. 18 minutes later, Cynthia was finally logged in at checkpoint #1, which was reassuring, but at the same time we were now dealing with a marathon field that had spread out over ten miles. 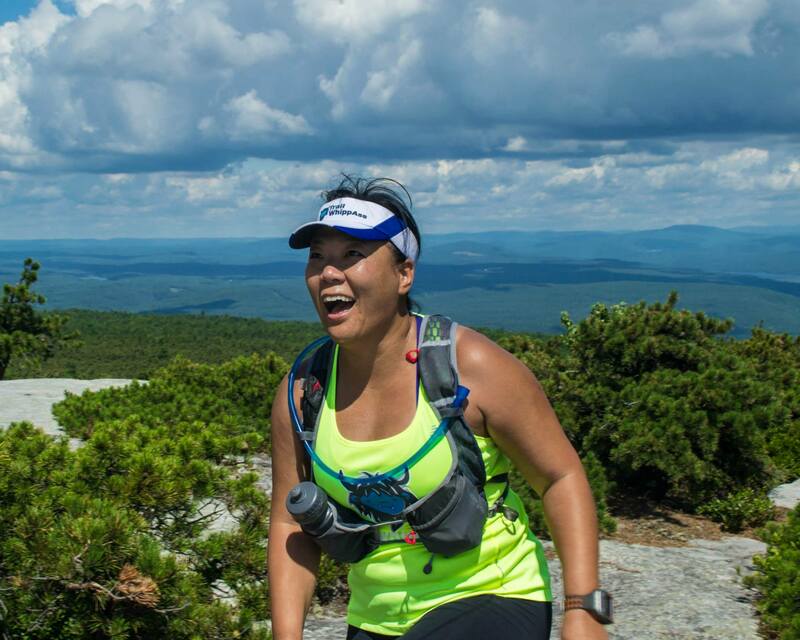 Barely had we settled in at High Point when the leaders in the 10-mile and half-marathon divisions arrived, panting and covered with sweat from the 2,000-foot climb. Racers were soon pouring across the summit. Some had missed a key intersection and gone as far as two miles out of their way. Others had missed a blaze in the woods and wandered off course. But even so, when people reached High Point and looked out at the panoramic views, they were all smiles. Now everyone’s attention turned to the south, where the marathoners would soon be appearing. Binoculars and camera zoom lenses scanned the trail, which wound along a white conglomerate rock shelf overlooking a steep gully. The minutes passed slowly. Then at 11:50 AM, Ben Nephew and Iain Ridgway clambered up a boulder and appeared on High Point. They glanced at us with dazed expressions on their faces as they trotted across the rock. The accumulated fatigue of racing neck and neck for 23 miles, the effort of running uphill, and exposure to the sun on the last leg of the course were beginning to tell. A few seconds later, they disappeared among the stunted pitch pines, headed downhill four miles and 2,000 feet to the finish. To help off-course runners, the race director’s phone number was placed on the maps provided to the runners, and during the event I fielded a number of calls. A pair of half-marathoners had followed the aqua-blazed Long Path down the side of the mountain — despite instructions not to do so, which I had given on a conference call we had held for participants a few days before the race and then repeated during the safety briefing. The same warning was also printed on the map, with an arrow pointing to the intersection. But I can’t blame them for making a mistake, because I know how hard it is to navigate while running; it’s very difficult to process so much information when your heart rate is elevated. No harm done. I told them to take a left when they hit the paved road, and they ran a couple of miles back to the start/ finish. Later on, a marathon runner called, convinced the trail had disappeared. He even texted me a picture. But then he found the next blaze and continued successfully to the end. Another marathoner encountered an abandoned cabin; I knew exactly where she was and directed her back on course. She ended up first female. Earlier in the morning, I had received a series of calls from one racer, but the calls dropped before I could hear anything. I dialed back, but was unable to get through. Unfortunately, I would later learn that this was one of four half-marathoners who had wandered off course on South Gully Trail and unable to reach me, returned to the start. These were the only DNFs of the entire event. We had tested cell-phone coverage at multiple points on the course, but hadn’t anticipated navigational problems in this location. For 2016, we will have improved procedures in place to support runners who go off course in this area. At 12:30 PM, I was back in the parking area at Sam’s Point, where I met the replacement course marshal for High Point, George Langberg, briefed him, and sent him via ATV to High Point to relieve Ken, Christine, and Miriam. Then I made the 25 minute drive out to checkpoint #2, concerned that several runners, including Cynthia, had not yet arrived. We had a hard cut-off at 1:30 PM and I anticipated we would have to pull some of the marathon participants from the course. On the way there, I asked John Schumaci, field director for Sam’s Point Search and Rescue, to be prepared to move SAR Team 1 in this direction should we need to conduct a search operation. But minutes after arriving, I discovered that everyone was accounted for. Cynthia had passed through at 12:23 PM, looking strong, and in high spirits. Now I drove back to the start/finish. At 3:00 PM the 10-mile and 1/2 marathon divisions were finished, and we had accountability for 20 out of 24 marathon runners through High Point. Marathoners were slowly trickling down the mountain and across the finish line. The event was winding down. Yet for the race organizers, our job wouldn’t be done until the last participant was accounted for safe and sound at the finish. And it was premature to celebrate, as we were hearing reports of people having trouble following the trail in the vicinity of Lake Awosting and of water sources that had dried up in just the last few days. By 4:00 PM, we had accountability for 23 out of 24 marathon runners through High Point. The only question mark was Cynthia. With the final cut-off for the event looming at 5:30 PM, the race staff and SAR teams were starting to worry she wouldn’t make it to the finish, especially if she were fatigued, dehydrated, or possibly injured. After some discussion, I directed the High Point course marshal to pull Cynthia from the course when she reached High Point — unless she showed up in the next few minutes. Then we began working on a contingency plan to move SAR Team 1 to Sam’s Point where they would head out on foot to find her. As we were talking, Cynthia arrived at High Point. The SAR team checked her out and gave a thumbs up. She was soon on her way down the mountain, and SAR Team 1 reported her passing by, with only three miles to the finish. We waited, as the clock continued to tick. No-one showed up. It was getting close to the final cut-off. I got on the radio with SAR Team 1, but they had lost her. And then suddenly, Cynthia appeared, but from behind us, walking up the road. She had overshot the turn-off from the trail and looped around through town. It was 5:26 PM, four minutes from the final cut-off. Cynthia sat down in the shade of a fire truck. She looked spent. I could appreciate the strain she had been under, not only from the rough terrain and hot sun, but also the constant mental challenge of navigating over unfamiliar terrain, especially when you’re at the back of the pack, under time pressure, with the clock ticking down. I have had lots of experience with land navigation as a hiker and runner and many years ago as an Army infantry officer. This means I have lots of experience with the stress of figuring out which way to go while on the move, with the fear of making the wrong decision or falling behind schedule, with the anxiety of getting lost. As I went over to check on her, Cynthia looked up at me, and I could tell from her eyes that she wasn’t whupped in the least. To the contrary, she started telling me about her next challenge, the Pikes Peak Marathon, and then she pointed out some areas where we could improve the map. Cynthia’s one tough runner, and I give her enormous credit for covering more miles than anyone else and impressing everyone she met with her determination and high spirits. All the racers deserve credit for taking on a challenging, unconventional, and adventurous event, without the typical support found in local trail races. I hope that they had a good experience moving across the mountains under their own resources and that they discovered some of the magic of the Shawangunks. From the feedback I’ve received so far, I believe they did. Ben Nephew and Iain Ridgway completed the marathon in an astonishing 4 hours 32 minutes. 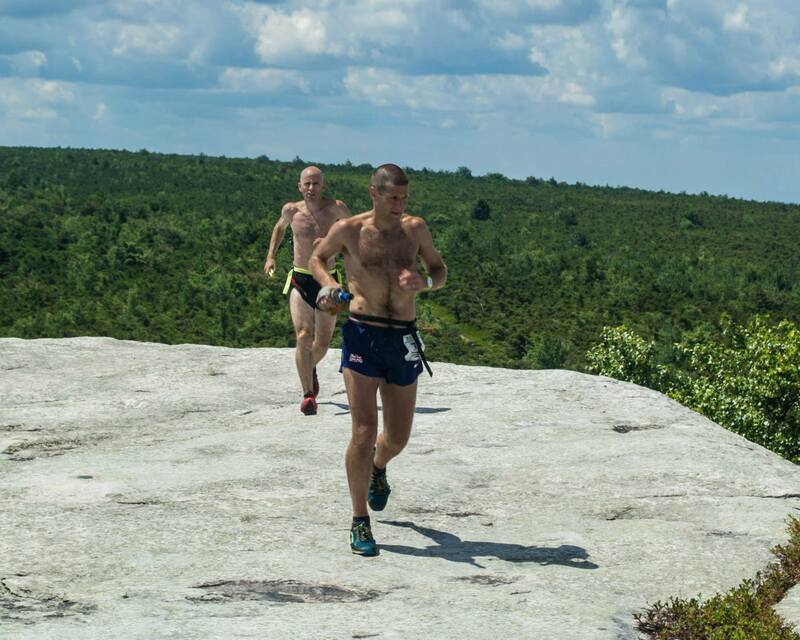 They are two of the fastest trail runners in the eastern U.S. At the Breakneck Marathon in April, Ben and Iain had sprinted to a very close finish, with Ben ahead by a fraction of a second. This time, Ben declared Iain the male winner. Elaine Allen was the female winner in 6 hours 1 minute. Because of the modest tone in her email, I had been slow to approve her application. Then I reviewed her track record of top place finishes in northeastern trail races — and issued the invitation as quickly as I could. First male for the 1/2 marathon was Ben Parker in 2 hours 29 minutes, and the first female was Rachel Wrightson in 3 hours 9 minutes. For the 10-mile division, first male was Benjamin Vince in 1 hour 54 minutes, and first female was Alison Smythe in 2 hours 19 minutes. Full results are available on Ultrasignup. In closing, I’d like to thank the town of Ellenville for permitting the event, Ulster County Sheriff’s Office for providing traffic control, Sam’s Point Search & Rescue for supporting the event, Ellenville Fire District for providing ATVs and skilled operators, Goosetown Communications for providing radios, New York State Department of Conservation, Sam’s Point Preserve, and Minnewaska State Park Preserve for permitting the event and providing guidance on safety and routing, our volunteer course marshals — Ian Erne, Judy O’Neill, Sue Eby, Kenneth and Christine Tom, Miriam Weiskind, and George Langberg — for helping us manage participant safety, start/finish volunteers Kathy Mahady, Jim Bixler, and Philip Posner, Aroma Thyme Bistro for providing drinks to finishers, Shoprite of Ellenville for providing fresh fruit, and Steve Aaron Photography for the winner’s prizes and the fantastic photos of the event. Also, I’d like to recognize the role that the Open Space Institute has played over many years in acquiring land that today constitutes much of the Gunks Greenway and thank the volunteers of the New York-New Jersey Trail Conference for their stewardship of the trails.